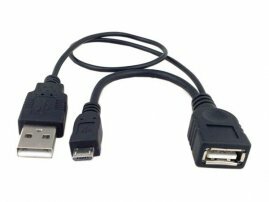 Micro USB OTG Host Cable with Extra Power for Card Readers : allputer.com - Accessories for all your Portable Electronics & Computers! This cable is to connect to your Galaxy Siii (and any other devices with OTG) for reading your data in your USB Flash Drive. The connection is so easy, just plug the Micro USB Side to your Samsung Galaxy S3 and plug your USB Flash Drive to the USB A Side, then your Galaxy S3 can read the data inside your USB Flash Drive.